Roys came in first in the gubernatorial straw poll with a commanding 30%, with Mike McCabe second at 19% and Kathleen Vinehout third with 16% of the vote. 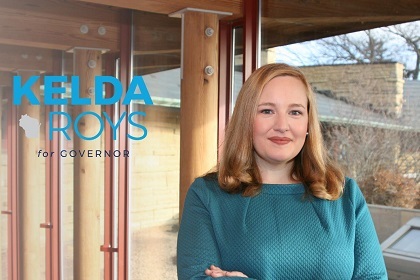 MADISON - At the 2nd Congressional District Democratic Convention last week, Kelda Roys came in first place in the gubernatorial straw poll with a commanding 30%, despite the large field. “Today’s results show that Wisconsin Democrats are looking for hope, optimism, and someone to vote for, not just something to vote against,” said Roys. “It’s clear that my message of restoring opportunity and fairness to our state is resonating with voters. “As I travel across Wisconsin to share my plans for supporting families and empowering small businesses, voters in every part of the state are responding positively. People are ready to turn the page, and start expanding access to healthcare, investing in universal pre-k and paid family leave, and raising wages for Wisconsin workers. Roys was also in Tomahawk today, attending the 7th CD Democratic convention, but they did not have a straw poll. Earlier this month, she was among the top four finishers in the Racine County Dems straw poll; the party did not release numbers or rankings. The 2nd Congressional District includes Madison, and borders Wisconsin Dells on the North, Janesville on the east and Platteville on the west.